Vea una caverna utilizada como cisterna de agua a partir del siglo IV. Visita a las ruinas de un antiguo teatro romano. 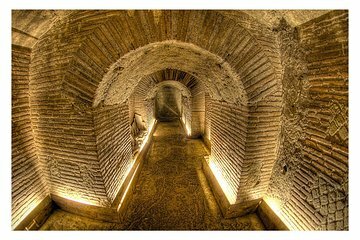 There are two Underground Tours in Naples, both starting from the same Piazza. The above picture is used by the other tour as a lead picture. It is not seen on the tour sold by this presentation. Indeed, we were sold a tour including a pizza only to discover the pizza location was not open on Wednesday. To make matters worse, the on-site tour operator sent us across town to another pizza place, which was also closed on Wednesday. Based on the problems, Viator did refund the tour cost. Thank you - but others should be aware of the misrepresentation in the tour itself and the pizza place being closed on Wednesday. Delightfully fun tour and worth seeing. There are a lot of steps and some tight passages, so be aware that you need to be comfortable climbing all the steps, okay in the dark and able to get through tight spots. The only thing I would change is that our group was right in front a group of school children. The children were loud at times and would push ahead to border our group - making it hard to hear our guide at times or enjoy the setting. I suggest that if school groups are going, there be more space between them and other groups - also maybe they need more chaperones to ensure the students are respectful of others. Beaucoup de plaisir lors de cette activité. Jules qui parle très bien français est un très bon guide. Our tour guide Maria was excellent. Well worth going to see the history of the old Naples and to hear the stories, especially the Nuns. Well organised and very interesting. Our guide was excellent. This is a very popular tour and there were lots of other groups going round at the same time as ours. The lighting was atmospheric and gave a real sense of what it would have been like to work and live in the tunnels and caverns. Really enjoyed it. Amazing! Gives another dimension to Naples! Highly recommend this tour. Just beware of 120 steps each way to climb! We all had a great time being shown round by an informative and excellent guide. My only slight disapointment was the end at the remains of the theatre as I had thought there was more of it left but there is only the below under stage rooms and corridors, a model of the old theatre and what remains would have been helpful in the last room of the tour. It is fascinating to see how the People of Naples have adapted and merged there working and living space with the old Theatre and tunnels. I highly recommend a visit this was one of my best tours of our trip. It was great to have booked the tour and be escorted to the front of the queue ready for the tour we were scheduled to attend. No waiting around. Cannot fault the fault the service. Great tour, was very interesting and really enjoyed.